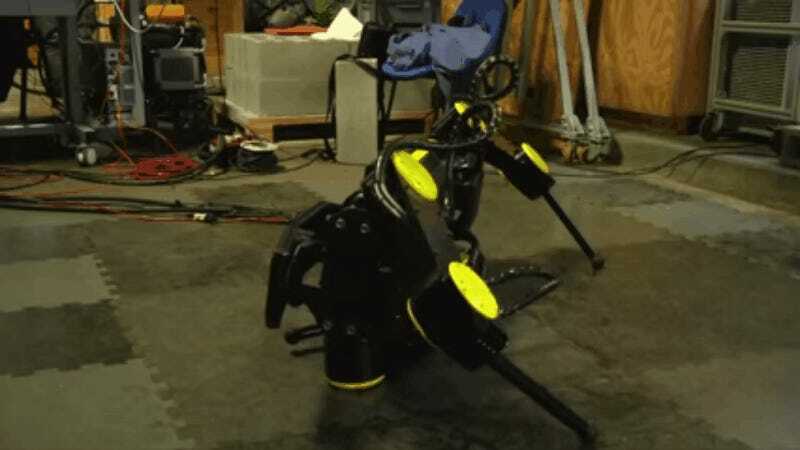 DARPA’s BigDog is a four-legged robot that’s too noisy for covert ops on the battlefield. But a different beast-inspired bot from Italy could have use elsewhere: Its legs allow it to trek through tough terrain in disasters, and springs up if it gets knocked over. The Italian Institute of Technology brings us HyQ2Max, a robot made of aluminum alloy and lightweight fiberglass that takes cues from nimble animals like goats. That enables the lightweight robo-critter to help first responders in tricky, unpredictable environments. Hydraulic quadroped robots aren’t anything new—in fact, they’ve been around for years. However, this latest one isn’t built for the battlefield like BigDog was, but for quake-and-tsunami-stricken spots. And its legs give it an edge. See, there’s been lots of development for disaster robots in the past couple years, especially in the wake of crises like Japan’s Tohoku earthquake and the follow-up Fukushima nuclear meltdown in 2011. A lot of the time, though, those helpful little rescue bots are wheeled or tracked, which limits the type of terrain they can traverse. That’s why new disaster bots, like HyQ2Max, are getting legs. Earlier this month at Tokyo’s International Robotics Exhibition, we saw Kawada Industries’ humanoid HRP-2, whose legs allow it to better navigate mounds of rubble and other irregular terrain. Of course, settings like crumbling buildings awaiting aftershocks aren’t exactly predictable places to be, what with debris liable to plummet from all angles at any given moment. But this mechanical animal is built to last. Its actuators, sensors, valves, and other sensitive electronics are protected inside the unit, and if it gets knocked down, it gets right back up in seconds. Next, the team tells Reuters that it’s working on a “centaur-style” robot that’ll have nimble arms mounted at the front of HyQ2Max, proving that the mythical animal kingdom is apparently rich, bizarre grounds for engineering inspiration, too.